A brilliant alternative to fish and chips! We make ours in a proper UK frying range and don't deviate whatsoever from the traditional process - handmade British sausage with custom grown potatoes made into traditional British chips. Fancy a change to fish and chips? Then why not go for a battered sausage? 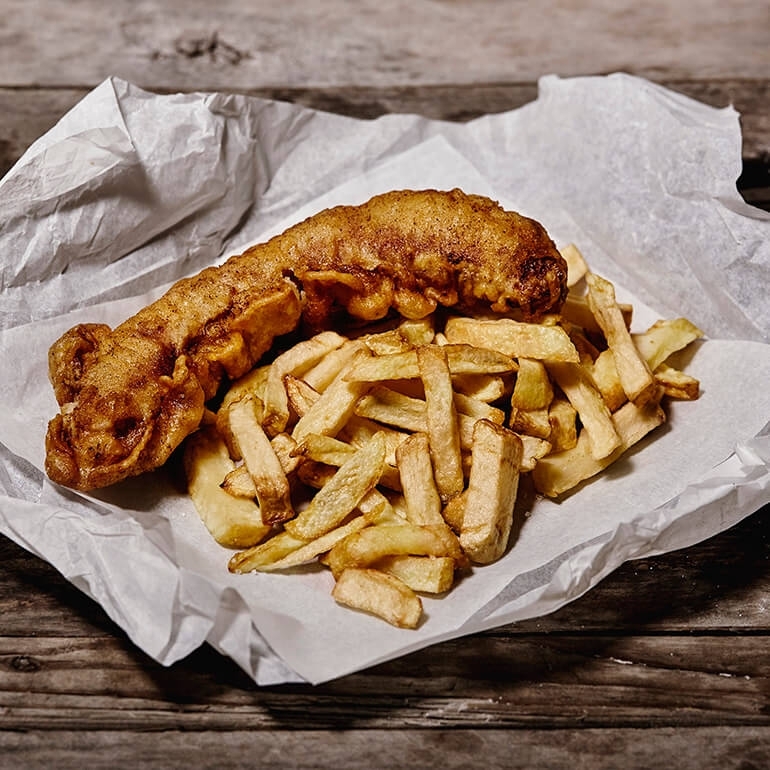 At Parker’s, we make it exactly how you’d find it in the UK: 9 inches of succulent, British chippy sausage, dipped in our secret recipe batter and fried in our authentic chip shop fryer until crisp and golden. As you’d expect from a proper British chip shop, each sausage comes with a hefty portion of thick-cut, traditionally fried chips made from fresh King Edward potatoes. All you have to do is reheat and enjoy as it is, with salt and vinegar or a large spoonful of mushy peas or baked beans. Sausage (Pork, Cereal, (Wheat flour, salt), Water, Seasoning (Wheat Flour, Dextrose, Cereal (Wheat Flour, Salt), Pentasodium Triphosphate, Citric Acid, Spices)), Potatoes, Batter (Flour, Water, Salt, Vinegar). I haven't cooked the sausages and chips as yet. I can make my prediction now because the sausages will make great meals. The sausages are always perfectly seasoned. Was remarkably surprised how good the chips were, sausage was a little chewy but batter was excellent. Perfectly portioned and delicious! Can't wait to put in another order. Thank you for giving me a proper taste of home! definitley a taste of home! Love the battered sausage this my 3rd order in as many months. A little bit of home every time I eat it. The battered sausage and chips were excellent, and brought me back to days in England at the chippy! I would definitely buy it again! Just like any of the other products purchased, outstanding! this by far the finest company I have ordered English products from. It reminds me so much of the time was living in England. excellent,reminded me of home.loved the chips ,,could of eaten another 2 plates worth. excellent! just like at home. when I ordered these I was a bit skeptical, I am from the UK so I was not expecting much, but wow you can't get any closer to the taste of the battered sausage and chips, I will keep on ordering these. This was the first time I had ordered from the EPC and I must say I really enjoyed the sausage and chips, the batter on the sausage was just like I remembered although the chips were kinda dry but i think that was my fault. Thanks EPC. One of our favorite "quick meal" treats in this household. It cooks up perfectly in the oven by following the directions on the container - though I would like to say "remove the paper inside the container". Our first time receiving this, we did not know and began cooking this dinner with the wax paper (I believe that is what is inside?) which made it super easy to turn the chips over halfway through the cooking time but also smoked and probably was not good to breathe in those vapors or anything else. HAHAHA! Once this is done cooking in the oven - splash on some Sarson's and a dash of salt over the chips and dig in! I had battered sausage and chips for the first time two years ago while I was visiting home and yours where just as good. Keep up the good work.